Welcome to Beer with Baby, a column in which beer writer Joshua Bernstein reviews craft brews through the eyes of a tired, over-stressed parent. Not too long ago, my daughter, Violet, had fingers like a quarter-sucking claw crane game at a boardwalk arcade. She’d size up a spoon, book, or stuffed animal and wrap her mini mitts around the object. Slowly, like a pneumatic lift inching a car heavenward, she’d raise it to her lips, where she could deduce the item’s prupose by gumming it—baby Braille. But just like that maddening claw machine, she’d drop the item an instant before inserting it into her maw, anatomy failing curiosity. Ever the dutiful parent, I’d pick up the item and set it before her again. We’d repeat the process 10 or 15 times, locked in some perverse Groundhog Day knockoff. Failure. Failure. Failure. Tears. It’s enough to drive a dad to drink a beer. These days, I’m consuming most of my parental Valium on my Brooklyn stoop. See, I live on the third floor of a 1910 building. As a result, we lack modern comforts such as a level floor, stove knobs, and central air. We own a bedroom AC, but it’s reserved for nighttime usage. Running it in conjunction with another appliance—say, a margarita-making blender—will blow our circuit breaker, forcing me to drink in the dark. The obvious solution to escaping sweatbox heat, electrical circuitry, and parental responsibility is my stoop. And beer, of course. Despite the New York City police department’s crackdown, the tradition of Brooklyn stoop drinking is alive and well. Lacking backyards, Brooklynites embrace the stoop as the best way to enjoy fresh air while remaining slightly removed from the passing circus. Stoop drinking has become my evening tradition with Violet. After grabbing her from the DUI checkpoint that is daycare, I set up camp outside with my mutt, Sammy. “Time for a pony ride,” I told Violet one recent eve, plopping her on my knee and bouncing her to glee. That’s the great thing about babies. They’ll believe anything. It’ll be years before she realizes my knee is no pony, and that Ginuwine never wrote a nursery rhyme. I can’t wait to introduce my daughter to beer—to help her discern the differences between bitter IPAs and cloudy witbiers, and understand why that -arita suffix is so evil. 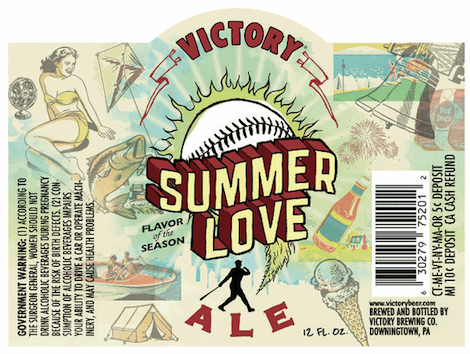 Sammy sat beside me, like a Corgi Sphinx, and I reached for my evening’s elixir: Victory Summer Love, a golden ale wrapped around a great tale. The beer was born four years ago as a partnership between Victory and Philadelphia’s tourism board, which wanted to find a way to move its “With Love, Philadelphia XOXO” motto behind the bar. The solution was a bright ale dosed with pleasantly earthy Tettnang, piney and citrusy Simcoe, and newfangled Citra hops, which lent a lovely tropical edge. Summer was a smash, and the one-off became a seasonal standby for Victory. “Violet, sweetheart, that’s not for you,” I said, looking down at my daughter. She’d wrapped her increasingly chunky hands around the bottle, her paws suddenly working like a G.I. Joe with Kung Fu Grip. Using every ounce of strength an 18-pound baby can muster, she brought the bottle to her rosy little lips, perhaps hoping divine the mysteries of daddy juice. Down the road, I can’t wait to introduce my daughter to beer—to help her discern the differences between bitter IPAs and cloudy witbiers, and understand why that -arita suffix is so evil. Now is not the time. I gently unwrapped her digits and reclaimed the bottle, finishing the beer in a few refreshing glugs. “Some mysteries should remain mysteries,” I said, placing her on my knee for another pony ride.